My Top Read of 2017!!!! Alright everyone, it’s time to get the band back together. And I don’t mean that band you or your daddy grew up listening. You know, the one that broke up years ago and decided to have a reunion tour because it was in demand, or because they ran out of money because they blew it all on stuff in the glory days. I’m talking about a War Band. The Band your or your daddy WISHED you had been apart of. The Band that toured everywhere, slaying everything in their path and reaping all the rewards. The famous band known as Saga. Your lead singer is a man named Clay Cooper, also known as Slowhand, who, instead of a mic, carries around a scarred wooden shield called Blackheart, made from the body of one of the mightiest treants in the land. Your electric guitar player/shredder/axe man is Gabriel, also known as Golden Gabe, gifted with the most valuable sword known to man. Your bass player, Ganelon, once turned into stone, now gets to relive his glory days with mighty axe in hand. Your keyboardist, King/former King Mattrick Skulldrummer, a drunk at heart and voracious pie eater, wields two vicious knives with which he slices and dices his way to victory. And lastly, you have your cowbell player, Arcandius Moog, a highly optimistic alchemist with the wherewithal to continue throwing trap after trap, fireball after wisp of smoke, whether they work or not, in order to help out his band mates. Nicholas Eames is going to be a household name very soon. This debut is, simply put, phenomenal. There is plenty of world building to go round and then some. His characters are detailed to the ‘t’, or is it ‘d’? Whatever. They are fleshed out incredibly and Jeff Harding brings them all to life with his brilliant audiobook narration. There isn’t a ton of hack n slash in the novel, but at the very end, we are given a Lord of the Rings: The Return of the Kingesque battle royale. I’m talking epic scale, all out warfare and it’s bloody wonderful. There is also a ton of humor in the novel which, in my opinion, just makes the book that much better. 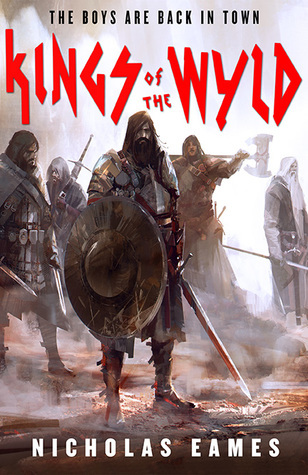 When thinking of Kings of the Wyld, I would say it is like The Expendables but with swords and alchemy instead of guns. Oh and monsters, tons of monsters. This book is amazing and you should hurry to grab a copy. Seriously, what’re you waiting for? One of my favourites ofast year too. Love the fight the chimaera.